Neferpitou is a cat-humanoid Chimera Ant and the firstborn of the Chimera Ant King's three Royal Guards. They are very loyal to the King, just like the rest of the Royal Guards and would sacrifice themselves for him. Neferpitou gets distracted easily, loves to play a lot and that makes them the most curious of the three Royal Guards. Hence their cat-like appearance, Pitou is a cat Chimera Ant who loves to play with their opponents like a cat would with their prey. 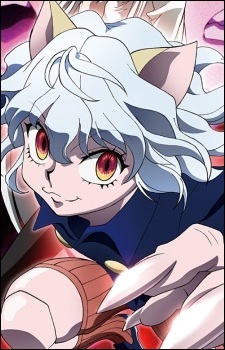 Despite their cheerful and playful manner, Pitou has a sadistic and terrifying personality as well. Unlike Menthuthuyoupi and Shaiapouf, Neferpitou does not seem to mind much in regards to Meruem's later newfound interests with Komugi. Thus, among the three Royal Guards, Neferpitou is the only one that greatly prioritizes Komugi's safety as opposed to how Menthuthuyoupi and Shaiapouf hate Komugi, something Neferpitou is aware of which creates distrust in regards to the matter, for making their king deviate from the path they envision for him. Neferpitou is later killed brutally by an enraged Gon, after revealing to him that Kite is beyond saving.